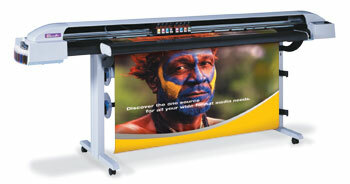 The NovaJet 850 is designed for speed, ink flexibility and outstanding image quality. The NovaJet 850’s eight-color performance produces incredible color gamut and smooth tonal gradations that far exceed that of standard six-color printers. Eight color ink sets from Encad create a new standard in wide-format inkjet quality. Our Octachrome ink set adds light cyan, light magenta, orange and green to the standard CMYK colors for increased color gamut and improved smoothness. The Ultra-Fi ink set adds light and medium dilutions of cyan and magenta to create flawless tonal gradations so impressive standard definitions of resolution become obsolete. Using either MAC or PC digital files, or by scanning documents, we can output originals in sizes from 6" to 42" wide by any length you require.